Mount Nebo is the mountain where Moses was allowed to see the Holy Land... and died. Nowadays the mountain is a memorial site. Here is the "Church of Moses", built by the first Christians. Ever since the first days of Christianity this mountain has been a holy place and a destination for pilgrimage. 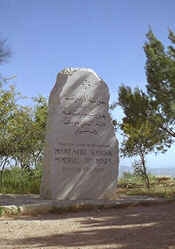 This stone says "Mount Nebo Siyagha. Memorial of Moses. Christian Holy Place." 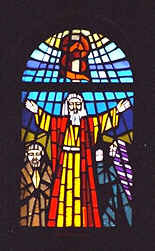 One of the windows in the Church of Moses. 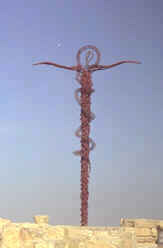 One good look at this snake on a stick will protect you from snakes. Like Moses, you can have a great view over Jordan, the Dead Sea and Israel. When the weather is clear, you should even be able to see Jerusalem, which is about 60 kilometers away. 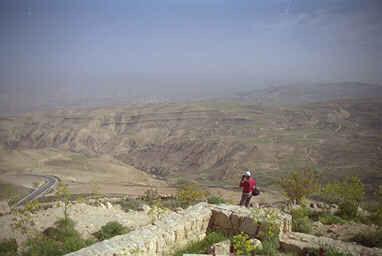 Unfortunately, there were some clouds when we were there, but the view of Jordan was great. For the best chances of a great view, come early in the morning or late in the evening. 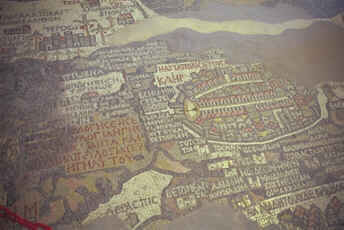 In the nearby town Madaba, there is a mosaic map of the Holy Land and lots of other mosaics. This particular mosaic can be found in the Greek Orthodox Church in the city center. Information about more mosaics in this area can be obtained in the Madaba museum.